On April 1-4, 2010; my club LOGSAC has conducted the 2010 Lenten Climb monitoring as part of our club’s calendar of events. The activity basically aimed at ensuring that Sta. Cruz trail to Mt. Apo would not be congregated with irresponsible climbers especially since issues regarding Mt. Apo’s closure hemmed in just one week before the holy week season. There were also several groups and government agencies who helped us during the monitoring such as the National Commission for Indigenous Peoples, Philippine Army, Sibulan Porters’ Association and Mountaineering Federation of Southern Mindanao who were tasked to keep an eye in the upper portion of Mt. Apo particularly in the summit area including holding camps in Tinikaran. I stayed at Tumpis then along with Jonas, Domas, Kabing and Faridah. However, we noticed one important agency that was not with us during the monitoring – the Department of Environment and Natural Resources (DENR). It is indeed a sad thing, considering that DENR’s main mandate is to save and protect the environment, the Mt. Apo Natural Park (MANP) to be exact. It was the first time it happened. When worst things happened in Mt. Apo last holy week season, DENR was nowhere to be found. Hopefully, concerned authorities of this agency will be able to realize the importance of having such an activity. • There were only a total of 94 trekkers (guides and porters included) who used Sta. Cruz as an entry point to Mt. Apo. Much as there were still climbers who wanted to be registered, we only accommodated registrants until March 31. Reasons for this include prevention of forest fire, avoiding huge environmental impact to MANP, among others. Also, the Local Government Unit of Sta. Cruz is always strictly following the recommended carrying capacity of a certain Mt. Apo trail which is only 250. • Based on verbal reports from friends in the mountaineering community, Bansalan trail had the most number of climbers passing through with a rough estimate of approximately 800 persons. Were those friends kidding me when saying of the figure? Eight hundred persons are extremely too much for a trail to carry in a single climb. I presumed the event was called SINGGIT SA KINAIYAHAN....indeed, nature I guess not only shouted, it even screamed with the impact it brought about. I hope LGUs should be aware of this kind of dilemma. Yes, tourism sprouts economic siblings but not to the point of compromising the environment. Undeniably, it is still the nature that is at stake here. • Still based on verbal reports, Digos City trail was open last holy week. My remark to Digos is that this LGU has really appreciated the economic value of mountaineering. Last year, the registration fee they imposed was 650 pesos per climber. This year, they accelerated it to 720 pesos (that’s 10% increase). Being one of the most accessible trails, Digos is still one of the entry points that climbers preferred to despite the expensive registration fee. However, the City Government might have not conducted proper briefing to their guests. As usual, sitio Colan of Sta. Cruz served as an exit point of some climbers registered in Digos. And when asked why they did so, they said they were not informed of the 1 entry-1 exit policy. And when asked of the exit fee, all they could do was said “we don’t have money anymore”. 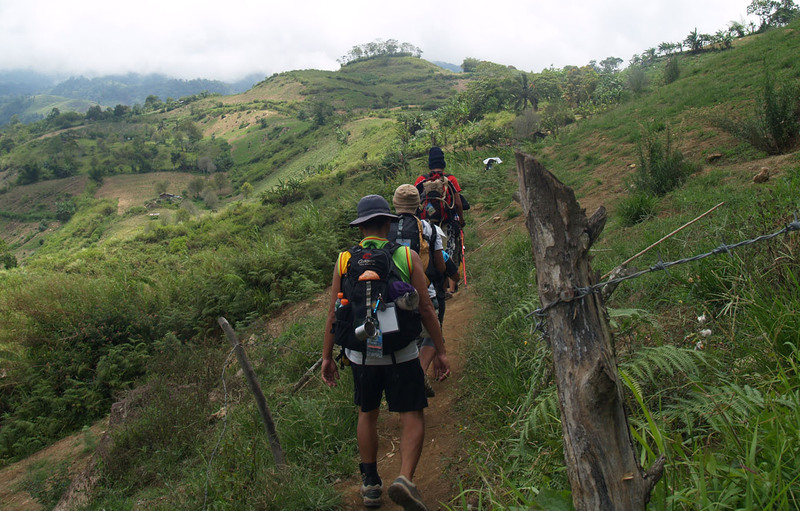 Until now for me it is still a puzzle why Digos trekkers are not lured to back trail. Trekkers passing Digos trail are perhaps the most stubborn climbers (puera de los Buenos). • Once again, solid wastes were familiar scenery in Mt. Apo during holy week. Environmentalists are correct in saying that Mt. Apo has been the largest garbage can in the country. The Sta. Cruz monitoring team has gathered bundles of garbage from the peak. Thanks to Raffy and company who really had the courage to bring those garbage down. I hope all LGUs opening their trails last holy week would be able to facilitate a straightforward rehabilitation effort to free this mountain of garbage. In the case of Sta. Cruz, they’ll have it this last week of April – an event called PISTA SA KINAIYAHAN. • Verbal reports from a very reliable source also pointed out that Mt. Apo summit last holy week was an instant entertainment club. There were climbers who never – or failed to realize the sacredness of Mt. Apo. Personally, there are things that even I sometimes had to violate. When I get there I always have some sort of drinking liquor. But not to the point of distressing other persons. That’s why I hate climbing Mt. Apo in a holy week. Every climber has reasons of climbing this mountain in the same way that intoxication has its own time also to shine. However, it should not be at the expense of those who wanted to relax and meditate. These are just mole out of a mountainous observation we generated while conducting monitoring activity in Mt. Apo. If these experiences will still be observed, there are so many reasons for a long-term closure of Mt. Apo to trekking activities. oh, oh, oh! what happen to the DENR?! hey, where are you people?! are you really concern to our KINAIYAHAN?! Good observation Jul! I hope we can all change...let us all be reminded that we are beyond mountaineering. if we will work hand-in hand (mountaineers, gov't agencies, local barangays)we can address this problem head on but if keep on boasting our PRIDE and CORRUPT MINDS we will not succeed in our cause. The problem is within ourselves...unless we change our view of what mountaineering is all about so we can change others. Just to mention a few! maybe you can add more.